The most complete & effective formula to support healthy blood pressure levels. Recommended by Dr. J. Seco, M.D., Cardiologist. With CoQ10 & Hawthorn Extract. 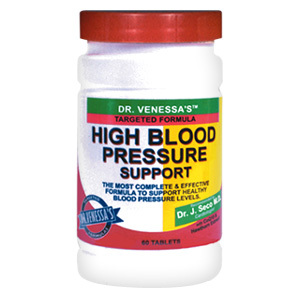 Dr. Venessa's Formulas™ is pleased to introduce the most complete and effective formula to support healthy blood pressure levels. As a dietary supplement, take 2 tablets with breakfast and 2 tablets with dinner. If pregnant or nursing, see your physician. other ingredients: Stearic Acid, Magnesium Stearate, Micro Crystalline Cellulose, Di-Calcium Phosphate. High Blood Pressure Support - is shipped in a discrete, unmarked package. Orders are processed immediately and usually take about 3 to 5 working days to be received. We do ask that you try it for 2 to 3 weeks to feel the full effects. Any information received is used only for order processing and shipping purposes. Your information, such as e-mail address, will never be disclosed to a third party.